Snowy owl season has officially begun. So far, three of these “white terrors of the north” have been spotted in Massachusetts, including one that was banded by Mass Audubon’s Norman Smith last year. Will this year by anything like last year’s invasion? Let’s consider the facts. 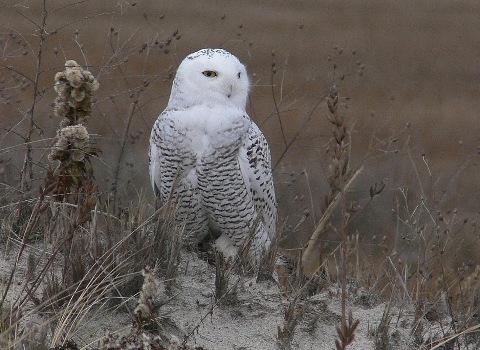 The Cornell Lab of Ornithology has put last year’s snowy owl event in excellent perspective. By December 5, 2011 snowy owls had been spotted in much of the northern half of the continental United States and as far south as Texas. Here Massachusetts, they stuck mostly to the coast. Sightings came from Westport, New Bedford, Nantucket, Orleans, Duxbury Beach, and of course, Plum Island. One reporter even saw one in Central Massachusetts from atop Mt. Watatic. But while the winter of 2011-2012 was the best recorded event of its kind, it was probably not as large as any number of historic flights. Just recent history shows that the 2008-2009 irruption was larger, when eBird input was at 44 percent of what it is today. In other words, fewer eyes reported more birds. Such irruptions happen every 3 to 6 years in the northeast, and, taking into account Christmas Bird Count data analyzed for the purposes of the State of the Birds report in 2011, it seems that the snowy owl population is currently holding in a stable position. Therefore, should we not expect another snowy owl invasion any time soon? Well that gets down to the question of cause, which is currently unanswerable. It’s hard to get a grasp on the drivers that force irruptions. That said, we do have historic numbers to consider. In 2002-03, Christmas Bird Counters in Massachusetts found 28 snowy owls; the following year, they found 4. In 2008-09, it was 40 snowy owls. The following year, 7. While the pattern does not always hold true, and there are variables to consider (i.e. the number of counters and the affectations of the weather on the counts), there does seem to generally be a drop off in the number of snowy owls in the state the year after an irruption. With questions still unanswered, one can see how important Blue Hills Trailside Museum Director Norman Smith’s work on snowy owls at Logan Airport has been. Norman has captured and banded nearly 500 birds at Logan—saving them from the dangers of the runways—and has tracked 14 of them through satellite telemetry. Every year we learn a little more about these fascinating birds; perhaps someday we’ll find the key to the secrets of their unexpected mass visitations to the state. Have you seen a snowy owl this year or in year’s past? Tell us about it in the comments. Interested in learning more? Join us for an upcoming program on snowy owls. This entry was posted in Nature Notes and tagged blue hills, owls on December 4, 2012 by Mass Audubon. December 28th, 2013. Spotted a Snowy owl up at the edge of the Rosa Rugosa in the lee of Gooseberry Island. It seemed quite imperturbable, swiveling its head this way and that, like a mechanized gun in a turret. There was another on Horseneck Beach in the driving wind, sitting above the sea foam on the edge of a low dune. It seemed more skittish and flew off to the top of a nearby building when it saw us. Snowy owl sighted one hour ago at corner of Story and Mt Auburn streets, roof of Harvard Square post office. “Dense, dark bars on white” — 1st year? I spotted one at my work in Lynn, MA yesterday 12/3/13. We are directly on the water. I have pictures to share if there is a way to upload. 11/16/13……spotted a snowy owl in my backyard in Pembroke. We studied it from inside using binoculars, then after a while I walked out with a camera to photograph it. It had perched in a tree about eight feet off the ground. After a few photos he flew very silently to another perch a few trees away. I then went back inside and left him to hunt. That’s a great. I was hoping they would be back soon. What area of Pembroke was this? I had a snowy owl in our woods for one or two days a few years ago. It may have been he winter of 2002-2005. Can’t remember exactly. It was interested in our bird feeders and flew onto the edge of our roof to get closer to them, but it didn’t attack any of the birds that I saw. I spotted a snowy owl on December 8th in the Boston Common of all places. We watched a female hunting rats and one mouse near the Park Street T Station for about an hour until she flew off behind some buildings heading toward Downtown Crossing. I never expected to see on on the Common! We were not able to get a good photo but do have a low quality video of her swooping toward a building after a rat. Oddly enough, we also saw a barred owl later that night on the walk to the parking garage. I didn’t realize the owls were using the Common, but it does offer a great food supply. We saw a snowy owl on the Sudbury River in November 2011, on our last paddle of the season. We launch at River Road and Rt 27 in Wayland, and saw the owl about a half mile north of there. Watched it for 10 minutes or so and saw it again on our way back an hour later. It was flying south against a stiff wind about forty feet off the ground. Round head, short tail, dodging and weaving to move southward. Beautiful sight. Many kayakers, including myself, saw a solitaary snowy owl in a tree by daylight in early spring 2012 along the Sudbury River. One evening in October I saw a beautiful snowy owl on a lampost near the corner of Tremont St & St Alphonsus St in Roxbury Crossing MA 02120. The bird stayed there for about 20 minutes & didn’t seem afraid. Most of the people that walked down the street were not aware the bird was there. An injured snowy was found in DeKalb, IL, about an hour west of Chicago on Nov. 20. Here’s his story. Beautiful guy/gal.